← It’s Cold as *$#%! How Cold? Colder than Mars! What is the connection between desire, the will, fantasy, and religion? 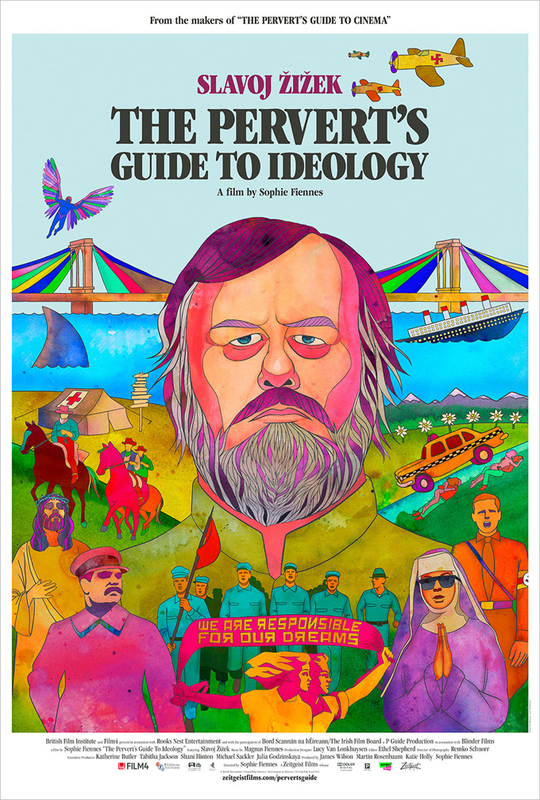 In the latest documentary by the controversial philosopher Slavoj Žižek, The Perverts Guide to Ideology, he argues that the connection is ideology. Teaming up with director Sophie Fiennes for a sequel to The Perverts Guide to Cinema, Žižek suggests that films such as “Taxi Driver” (1976) and “Full Metal Jacket” (1987) expose the fantasmatic core of ideology. Žižek starts the film by exploring John Carpenter’s 1988 cult classic “They Live.” In Carpenter’s movie an unemployed drifter named “Nada,” finds a box of magical sunglasses in an abandoned church. When Nada puts on the glasses he discovers that seemingly innocuous billboards with products for sale and advertisements for travel contain hidden messages such as “OBEY” and “MARRY AND REPRODUCE.” Žižek points out that these glasses effectively function as “critique of ideology glasses,” revealing that behind the surface presentation of capitalism lies a whole host of cultural imperatives. Provocatively, Žižek suggests that ideology is not an abstract doctrine imposed upon us from above—some political or religious ‘ism’ that is forced down our throats—but emerges from our deepest fantasies and beliefs. He argues that we enjoy our ideology because it feeds off our desires. Žižek’s ultimate point is easy enough to understand: if we want to change how the world appears at the political and economic level then we have to “change the way we dream.” As he asks near the end of the film, “how come it is easier for us to imagine the end of all life on earth—an asteroid hitting the planet—then a modest change to our economic order?” Nevertheless, Žižek does not simply suggest that we throw off the yoke of the Big Other (the idea of God, the State, the media) and free ourselves from ideology; he is no simplistic peddler of ideas. Rather, he argues that the Big Other emerges from our will (individual and collective) and that if we want to change how the world appears to us we have to start with our minds. Through an analysis of Kinder Surprise chocolate and Beethoven’s “Ode to Joy,” Žižek goes on to argue that we use fantasy to cover up (or frame) the chaos and inoperativity of our desires, and only by becoming aware of the process by which we construct these frames can we reclaim our freedom. ‘Buy this coffee, it will help save Guatemalan children’; ‘Select this organic apple, it will save the rainforest’; ‘choose a diamond ring as a wedding engagement present, it will show her you love her.’ What we must learn to see is how the larger than life narratives of capitalism, democracy, and eternal love feed off the absence at the heart of desire. Hence, whether we are trying to understand the role of love in James Cameron’s “Titanic” (1996) or patriotic duty in Mikheil Chiaureli’s “The Fall of Berlin” (1950) we must learn to question how fantasy is being used to frame our desire for political or economic ends. Žižek’s ultimate example of this arrives near the end of the film when he discusses Martin Scorsese’s “The Last Temptation of Christ” (1988). What Žižek likes about this movie is the hysterical questioning of God’s existence by the Jewish carpenter “Jesus.” Žižek suggests that Scorsese’s atheist portrayal of Jesus brilliantly captures the absence at the heart of Christianity (and ideology in general) by exposing the impotence of God in the face of his own death. He points out that when Jesus is on the cross and just about to die he recognizes the impotence of God and comes to grips with his own existential situation. Žižek contends that this atheist core is ultimately what Christianity offers us, and that it is testament to the absence at the heart of all belief. Like Scorsese’s Jesus, we have to face up to the absence at the heart of all identification and recognize that reclaiming our freedom is our own responsibility. Whether you love Žižek or hate him, you will at the very least find this film entertaining. It is oddly amusing to watch him talk theory in front of a garbage container, drink warm Coca-Cola in the desert, and slowly chew a Kinder surprise. However, the vast theoretical net that Žižek casts raises more questions than it answers and one cannot help but wonder whether the solution Žižek posits falls victim to his own critique of ideology. That is, what if the will that he suggests undergirds ideological structures is itself the fanstasmatic projection of the philosopher? What if the freedom he sees in the death of God is merely another fantasy? Once you recognize that desire, will, fantasy, and religion are intertwined, how do you tease them apart without creating a new ideology? This entry was posted in Politics and Religion, Religion and Popular Culture, Religion and Society, Religion and Theory, Tenzan Eaghll, Theory and Method, Theory in the Real World and tagged Baron Georg von Trapp, Beethoven, Capitalism, Catholic Church, democracy, fantasmatic, Full Metal Jacket, Ideology, James Cameron, John Carpenter, Maria Rainer, Martin Scorsese, Mikheil Chiaureli, Occupy Wall Street, Slavoj Žižek, Tahrir Square, Taxi Driver, the Big Other, The Fall of Berlin, The Last Temptation of Christ, The Sound of Music, They Live, Titanic. Bookmark the permalink.